People will often tell you that business is all about perfectionism, competitiveness, and power. In other words, it’s a dog eat dog world. But let’s be honest, when has that attitude ever ended in anything other than stress, frustration, and burnout? Just because you and your team are dreaming big, it doesn’t mean a positive work culture has to take a back seat. In fact, culture should be your priority. Having a reputation as an inclusive and supportive employer not only helps you retain high-class performers, but it makes it easier to recruit star talent too. So how do you create a workplace culture that’s destined to attract the best and brightest stars? Here are a few tips and tricks to get you started. Let’s start with the basics. Your team is the building blocks of a good workplace culture, so make sure you pick a good bunch. 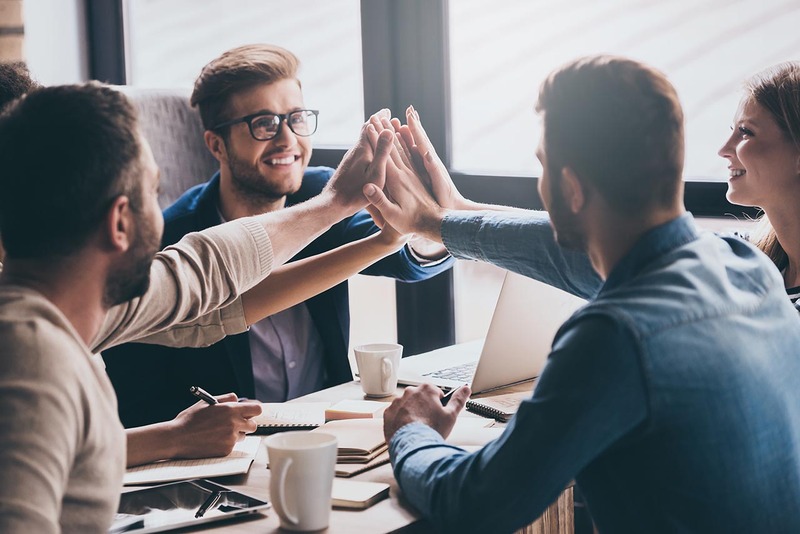 Hiring skilled, flexible, and motivated employees who have a passion for what they do is the first step to building a culture that fosters talent. But that doesn’t mean you should just pick and choose the best and the brightest. Instead, think about how the team will fit together as a whole. Impressive resumes are all well and good, but personality is just as important – especially when it comes to building a close-knit team. Improved productivity in your workplace? Download our checklist to identify some key areas to focus on. When you’re hiring, it can be tempting to focus on individual responsibilities and roles without ever communicating a wider vision. But however clichéd it may sound, joint values are an essential part of a positive work culture. Why? Because when you talk about long-term visions, you remind everybody that they’re part of something big. That their contribution is genuinely important – not just in achieving business goals, but in shaping them too. Recruitment is a two-way street. Not only do candidates have to impress, but they have to be impressed. The same goes for your current employees. You expect them to work hard, but in return, you need to give them something to work for. And an innovative workplace is a good place to start. Better tech allows for more flexibility. Invest in tools that let your employees work remotely, and still be able to attend meetings. Don’t rely on senior management for the best ideas. Maybe the shy new intern will come forward with a suggestion that will raise the roof – if only you let him. Remember that ideas can (and should) come from anyone and everyone. So to ensure they all get heard, make sure your communication channels are as open and inclusive as possible. But creativity doesn’t come for free. In return, you’ll need to nurture your employees’ skills and ensure everyone feels like a real part of the team. After all, business success starts with individual talent. When it comes to building a great work culture, you need to throw away the rule book. You might think that traditional office politics and hierarchies are part and parcel of business, but think about who they’re really benefiting. Instead, focus on the wants and needs of your whole team – not just the top few. So if 9-5 isn’t working for everybody, think about how you can adapt it. Or if some people need the freedom to work from home, brainstorm the ways you can make it happen. The best businesses let people work their best – even if it means shaking things up.